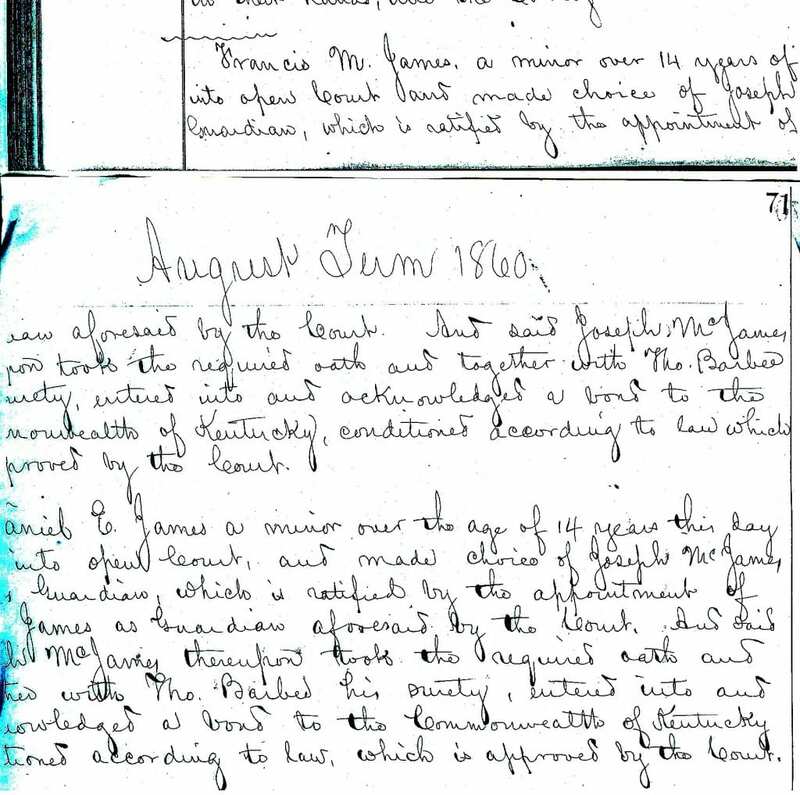 In August of 1860, Francis Marion James Sr. and his brother Daniel Ephriam James entered open court at Boyle County Courthouse in Kentucky, to either declare their father Joseph McAlsiter James as their guardian or to declare themselves as independent of their family. They chose to remain with their father. The boys’ mother, Elizabeth Vardeman James had died sometime about 1846, a year after D. E. was born. She probably died giving birth to a stillborn child. Their father promptly remarried in October of that year to Margaret Wood. 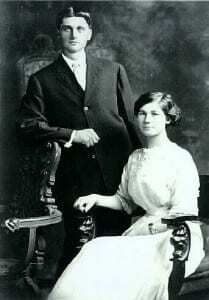 By the time Marion and D. E. appeared in court, the boys had five additional siblings, Thomas William, Mary Ellen, Martha Jane, George Thomas, and John Robert James who would become a respected Baptist minister. Francis M. James, a minor over 14 years of age…into open Court and made choice of Joseph McJames, Guardian, which is certified by the appointment of…Guardian aforesaid by the Court. And said Joseph McJames…pon took the required oath and together with Thomas Barbee…surety entered in and acknowledged a bond to the Commonwealth of Kentucky, conditioned according to law which…proved by the Court. Daniel E. (Ephriam) James, a minor over the age of 14 years this day…into open Court, and made choice of Joseph McJames, Guardian, which is ratified by the appointment of…James as Guardian aforesaid by the Court. And said Joseph McJames thereupon took the required oath and together with Thomas Barbee his surety, entered into and acknowledged a bond to the Commonwealth of Kentucky, conditions according to law, which is approved by the Court. 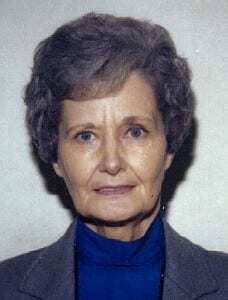 My grandma, Margaret Helen James, was born in Fort Benton, Montana on January 30, 1926. Dr. Kaulback was the attending physician, and she would see him many times throughout her life. Dr. Kaulback moved to Spokane, and during the last years of his life Grandma went to see him several times. Grandma was the last of 4 children – two older sisters and a brother – Eleanor, Agnes and Dudley. They all went to a one room schoolhouse in the country. When Grandma was about four, her brother Dudley came home with a clever way to make a stove which some of the school children had taught him. Grandma and her brother were never allowed to play with matches; so they went out of sight to do this experimenting. And, where did they go? Yes, they picked a stack of beautiful newly mown hay as a shelter for their work—the stack only being about thirty feet or so from their big red barn. They set up a few bricks or rocks, then took a rubber hose probably from a car to use for a chimney and ran the chimney up on the wire which bound the prairie hay. After lighting a match, they believed they had an excellent stove – until to their astonishment, the flames went right up the chimney with the smoke; and before they could realize what was taking place, the hay was ablaze. It was summer and her sister Agnes was coming to milk the cows. Grandma and her brother ran, hoping that Agnes would have water in the milk bucket, but to no avail. One of the neighbors, Mr. Weibel, and the rest of Grandma’s family worked until 3:00 am, fighting the fire so it would not start-up again and spread and burn the barn. A chastisement was in order, but Mr. Weibel calmed down Grandma’s father. Of course, Grandma and Dudley were put to bed and told to stay there which was worse punishment than a spanking; the kids would like to have seen the finish of what “they” had started. This was one of many lessons in obedience – DON’T PLAY WITH MATCHES! Their family owned sheep, pigs, cattle and horses. Grandma and Dudley used to go out in the outhouse at night and sing cowboy songs: Little Joe the Wrangler, Home on the Range, Strawberry Roan, and Red River Valley. Probably all the neighbors could hear them. Grandma had a riding horse named Dandy with a big scar on his face – they used to say he was an Indian pony. Grandma always rode on the back of the horse and Dudley in the front. Once Dudley was going under the clothesline, so he ducked his head; unfortunately, Grandma didn’t duck, and she quickly plummeted to the ground. Grandma said that she never knew how poor her family was until they moved to town. There, in town, they had electricity, running water in their home, central heating, and indoor bathrooms. Their first toilet had the pull-chains for flushing. For Grandma, this life seemed like heaven. Living in the country, Grandma was convinced, molded their lives and then they moved to town for polishing. This was the very best of two worlds, Grandma believed. Grandma was given a little white kitten. One day she was running to the barn and this cat “Snowball” jumped up on her face clawing it until she was pretty bloody. She never asked, but, when she was a little wiser, she was sure that her dad probably got rid of that cat, as she never saw it again. Grandma always had two marks above her lip from that incident. When Grandma was 12 she was out on the lawn playing ball with her dad when a fellow by the name of Keith Squires came looking for a place to live – he roomed and boarded with Grandma’s family while he was barbering in town. Little did they know that they would eventually marry. Grandma was a good student and very smart. In high school she took Algebra, geometry, Biology, World History, typing, Shorthand and was in the 4-H Club. Grandma’s cooking was unmatchable! She loved holidays when the family gathered in her home for memorable meals and time together. Many will remember carving the turkey 2 years before she passed—to find the inside was incredibly GREEN! Every meal she prepared was presented with meticulous perfection. It would be impossible to praise it too much. For example, at age 15 her cooking won a trip to Chicago for her to judge jellies and other foods. She was on the train coming home when they got word that Japan had bombed Pearl Harbor – December 7, 1941. In addition to her unparalleled cooking, Grandma was a talented seamstress. For example, at the age of 16, grandma made a wool dress for the 4-H club for which she won a red ribbon in the national competition, held in Chicago. Her sister, Eleanor, gave her a wine velvet dress to wear to nice affairs like this from which she later made a little dress worn by her daughters and granddaughters. Grandma was President of her senior class. She took chemistry, more typing, shorthand and bookkeeping. She used these skills later in life as she always kept the books for whatever business dad was in. Grandma moved to Spokane to work, where she met Grandpa who was being treated at the Veterans Hospital. They courted and were married shortly afterwards on November 4, 1945. Mom wore her sister Eleanor’s $100 wedding dress, which would later be worn by two of their daughters and a granddaughter. Grandma, as many of you are well aware of, possessed the brilliant talent of quilting. I think we all have a flannel quilt or two that she made. She also made a purple and lavender one with the applique of a ring of flowers in the center. Grandpa bought her a 1950 Ford. She was driving down Sprague one day and came to the Pines intersection in Opportunity. Much to her surprise, but luckily not to her misfortune, the steering wheel came off. Fortunately, she ended up in the corner service station with her hands still firmly grasped to the detached steering wheel. She didn’t like that one bit. Grandma was very talented. She spent many hours making all the drapes in her homes. She bought 200 yards of material to make the drapes in just one of her homes. Grandma also made many clothes for herself, her children, and her mother. She made beautiful dresses for the Gold and Green Balls they had at church. She also made many blankets for the grandkids. Grandma and Grandpa went on a mission for the church in 1988 to Manchester England, and of course it was a genealogy mission. Her religion became a way of life. She remained firm in the faith, committed to her covenants, and her life was a sermon of what she believed. Grandma held many church positions including: Primary President, Relief Society President, Relief Society teacher, and visiting teacher. She has spent most of her life doing genealogy and working in the genealogy library. She will have many jewels in her crown for the many, many hours she has spent doing temple work for her deceased ancestors. Grandma had many experiences, some fun, some happy, some sad, some spiritual, and some very wonderful. These experiences shaped Grandma’s remarkable character and provided her with priceless insights about life. We will miss the fun times and all the good food at Grandma’s house. She will be greatly missed by her children and grandchildren, her many friends, and all who knew her. Season’s Greetings from Stray Leaves. For over fifteen years, the late Thurston James played Santa Claus at the Sherman Oaks Galleria in Sherman Oaks, California. Countless children, former children, and children at heart recall Thurston fondly. Here Thurston shares a special Christmas tune he wrote and performed for his own grandchildren. The pictures are from the 1909 Victorian home in Danville, Kentucky, of Thomas Stratton Lanier Sr. & his wife Margaret Sallee, related to the James family. The home as seen was formerly owned by Stray Leaves publisher Eric James. Official website for the family of Frank & Jesse James – Living lives, telling the story. Knowing self. HELP! Virginia Hill Mimms Escaped! Who Wrote the Jesse James Family Tree? Jesse James, Prince of Robbers!